One failed a couple of times in Class 12 and yet made projects for college-goers. While the other ended up making a drone after finding no takers for his dream project. When they finally bumped into each other early this year, they became partners in passion and programming. Sitting in a room full of gadgets and accessories, two young boys are busy discussing the programming model of a bot— a computer program that works automatically, especially one that searches for and finds information on the internet—they’ve been working on from past few days. 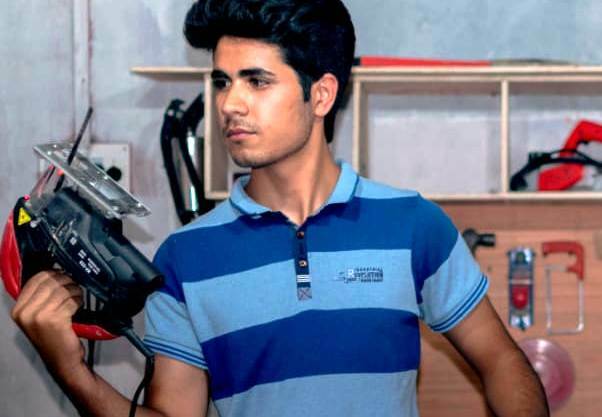 After running into each other at a competition in early 2018, the duo from Srinagar went on to surprise many by their diligent performance in robotics. One of them, Sheikh Najeeb Shafi, 21, spends most of his time in his 12/14 room, especially on his computer desk, surrounded by accessories, wooden bots and electronic gadgets. The only other person whose presence in this room makes Najeeb comfortable is Mir Faizan, a 12th standard student, and his partner in passion. Their discussion on the programming of bots usually continues for hours. But that hardly bothered him. Back on the computer desk, he asks his friend Faizan to check the application on his android phone that controls their bot made of a wooden frame, and some electronic motors and parts fixed inside it. In early 2018, Najeeb met Faizan at a qualifying exam of India Skills. Both of them participated in the competition as a team, and ended up as runner-ups at the regional level. Few years back, Faizan had surprised everyone when he won a bronze medal at IIT Delhi. “I went there as a 9th standard student to compete with the students of IIT Delhi and ended up winning a bronze,” says Faizan claiming it to be his memorable achievement. Unlike his friend Najeeb, Faizan always received an overwhelming support from his family and teachers. “Breaking up toys and other things around me was always a part of me that fortunately was noticed by my family and teachers in a very positive way,” says Faizan, who as a child was curious to know the flying mechanism of aeroplanes and jets. However, he failed to complete the project, as he lacked the highly sophisticated machinery to make parts of the jet engine. On the computer desk, Faizan directs Najeeb to fix the pending wire connections, as the mobile application is fully loaded on his smart phone. At the moment, the duo is preparing for India Skills competition and both of them are highly hopeful to make it to the international level, sooner or later. At the same time, they’re pursuing their academics—Faizan is in Class 12, while Najeeb has got an admission in B-Tech first year lately. Back to the wooden computer desk that Najeeb has made for himself in his messy room, the two wheeler bot is all set to go. “What’s the thing that can balance itself on two legs apart from humans,” Najeeb asks Faizan. And soon, as the two-wheeler bot starts running on its two wooden wheels, the two diligent nerds quietly exchange smiles and return to their work table.